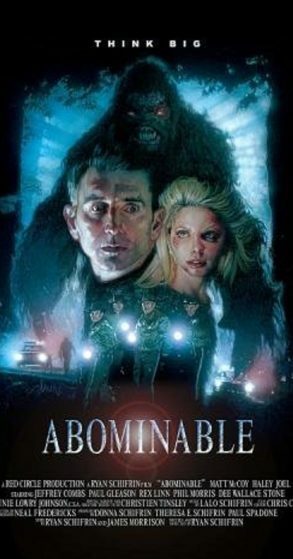 Abominable is a 2006 horror film wirtten & directed by Ryan Schifrin (Tales of Halloween, Evil Hill, No Rest for the Wicked: A Basil & Moebius Adventure, King in the Box, & The Tiffany Problem). It was co-produced by the Sci Fi Channel. It’s considered one of their best original productions. Rex Linn only agreed to act in the movie under the condition that he got to play the monster in one scene. Paul Gleason is seen taking a sip from a mug with the quote “Don’t mess with the bull”. It’s a reference to his most famous character of Principal Richard Vernon from The Breakfast Club. Rex Linn was working on CSI: Miami at the same time as this. It premiered on April 10, 2006 in New York City. A farmer named Billy Hoss (played by: Rex Linn from CSI: Miami, Cliffhanger, Wyatt Earp, Breakdown, & Better Call Saul) & his wife Ethel (played by: Dee Wallace from E.T., Critters, Cujo, & The Howling) wake up in the middle of night after hearing weird sounds outside. They find a dead horse & their dog vanishes soon after. They see a giant mysterious shadow behind their home. It goes to a man bound in a wheelchair named Preston Rogers (played by: Matt McCoy from Seinfeld, Carnivàle, Police Academy 5/6, & L.A. Confidential) going back to his home. Otis Wilhelm (played by: Special Effects artist Christien Tinsley from American Horror Story, Westworld, American Gods, & No Country for Old Men) is the nurse responsible for watching & taking care of him. He stops by a gas station & gets a warning about Preston by local clerk Buddy (played by: Jeffery Combs from Re-Animator franchise, The Frighteners, From Beyond, & Doctor Mordrid). A group of girls which include Michelle (played by: Natalie Compagno from American Dreams, Paperdolls, & Hollywood), C.J. (played by: Karin Anna Cheung from Better Luck Tomorrow, The People I’ve Slept With, & Rice on White), Tracy (played by: Scream Queen Tiffany Shepis from Tromeo and Juliet, Night of the Demons, Sharknado 2, & Victor Crowley), & Amanda (played by: Haley Joel from Summerland, American Dreams, & Crash Landing) are throwing a bachelorette party for their friend Karen (played by: Ashley Hartman from The O.C.). Preston sees one of the girls vanish out of no where. He’s worried something is wrong outside the woods. He tries to get help but no one believes him. Later in the night, Three hunters which include Billy, Buddy, & Ziegler Dane (played by: Lance Henriksen from Pumpkinhead, Near Dark, The Terminator, Alien franchise, & Hard Target) are out looking for what they think was a Sasquatch (played by: Michael Deak from Cellar Dweller, Ghoulies II, Arena, & Tales from the Darkside: The Movie) that attacked Billy’s home earlier. They run into a huge surprise & it ends up a mistake trying to follow this creature. Next door, confined in his chair Preston witnesses more mayhem with the unknown monster terrorizing the girls. Sheriff Halderman (played by: Paul Gleason from The Breakfast Club, Trading Places, Die Hard, & Maniac Cop 3) thinks his warnings are false & tells him to stop sending them pranks. One of the girls comes to Preston for help. They all have to find out a way to defeat this murderous monster. The police (played by: Phil Morris from Seinfeld, Chad Smith from Tears of the Sun, Josh Wolfe from Detour & Paul Spadone) finally show up after not believing them originally & it’s a fight for survival!!!! Just imagine Rear Window as a creature feature. I know it sounds like an odd mix but it actually works. Honestly, this is my all time favorite Bigfoot / Sasquatch / Abominable Snowman film ever made! It definitely stands out from all the other ones out there. It mainly uses practical effects so it had a retro vibe to it. It’s a brutal production & it has all kinds of gruesome moments in it. This monster movie doesn’t hold back at all. I love the fact that they tease you with the creature during the whole time. It barely shows him until the end so it adds to the suspense & thrills plus when you do finally get to see him it’s has a much bigger impact. It keeps to a few locations & stays pretty isolated from everything else. I liked how it focused on a few things & didn’t go all over the place. The set pieces & locations were perfect for this. I was very impressed with a few certain things for Abominable. All of the actresses in this feature were drop dead gorgeous especially Scream Queen Tiffany Shepis. That shower scene is great & she was actually pregnant during it but you can’t even tell. The casting for this was top notch with all the familiar faces & cameos for this independent production. This is pure entertainment & it’s so much fun to watch. This new cut has improved my viewing experience & I didn’t think that was possible with this!!!! Let’s talk about the high definition presentation. This 1080p (1.78:1) transfer comes from a 2K scan of the original camera negative. This is a completely new version of the film. Files were lost so it had to be re-edited, opening credits updated, & the visual effects were re-done from the previous DVD releases (Anchor Bay & Lions Gate). It also had color timing & correction to enhance the overall production. As far as upgrades go, this is one of the best I’ve ever seen! I can’t believe how much better it looks now. The visuals are elevated in every possible way. The older version CAN’T even compare to this anymore. That’s coming from someone that really enjoyed it! It’s a definitely feels like a whole new experience with this. That’s not the only improvement on this feature. The disc offers two different audio options DTS-HD Master Audio 5.1 & LPCM 2.0! Before from the previous DVD releases, I thought the sound was decent on this but nothing that really stood out but not on this new release! It sounds amazing in my home system & it adds to the whole atmosphere of the production. It’s on a whole new level. 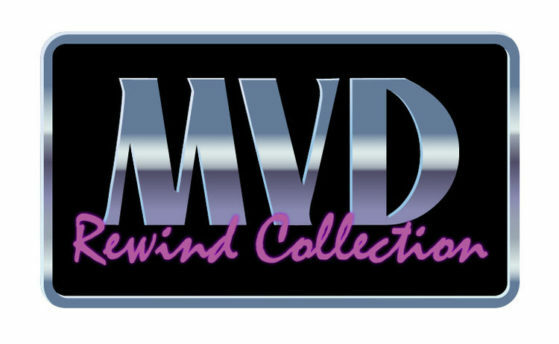 Let’s discuss the special features on this release from the MVD Rewind Collection. Brand new introduction from Director Ryan Schifrin that runs a little over 8 minutes. He talks about the new transfer & cut of the film. He tells the differences between this & the original version like re-editing, color timing/correction, the opening credits, & updated all the visual effects in this. He says they never made a 35MM print of this before & it wasn’t mastered in high definition at the time since blu ray was still new. He mentions the film was only going to be released as DVD & on television at the moment so that’s why it was put out that way. He thinks the monster looks better in this new version & curious to see what others think about it. Archival Audio Commentary with writer/director Ryan Schifrin, Editor Chris Conlee, Actors Matt McCoy & Jeffrey Combs. Ryan Schifrin talks about all the favors he got while making this feature. He talks about Rear Window being an inspiration for this. He mentions he really wanted to make a horror film so he basically combined the two to make this. He brings up Oscar Winner Christien Tinsley made his acting debut in this. He says he was already a method actor in his first performance. He grew a mustache & shaved the bald spot in the back of his head to add to the character. Jeffrey Combs joined the track around the 9 minute mark. He talks about his look in the film. He says he was inspired by his relatives mainly his uncle for this role. Ryan mentions his actions for certain people in here to move the story in a specific direction. He jokes about a blooper that took place where one of the actors crashed a car while filming. They talk about scenes that were added that weren’t in the original cut. Matt Mccoy discusses the challenges of the lead role. Ryan quotes Hitchcock during a scene. Jeffrey Combs returns to the commentary when his character pops up again. They bring up Lance Henriksen & his participation in this. They talk about having a delay shooting because of concert near by. They mention a location they used has been seen in many other projects. They talk about Lance wanting to shoot out his gun & the director’s wife had to get a permit the last minute to make it happen. The famous Wilhelm Scream is brought up when it’s used here. They bring up Tiffany Shepis & her popularity in this genre. They discuss the special effects. The director points out his Sam Raimi & George Romero homages in this. Mccoy brings up that he has worked on a few Bigfoot movies. They joke about a possible sequel. They talk about various locations. They mention cast & crew members. This is pretty spot on when it comes to scene specific & they go into detail about what you are watching. It’s mainly between Schifrin & Mccoy but the other two show up every once in awhile. The archival “Back to Genre: Making ABOMINABLE” featurette is a little over 37 minutes. Ryan Schifrin says he came up with the concept of this on his honeymoon. He talks about horror being watered down & too much PG these days. Various cast members talk about the horror genre & the production of this feature. Rex Linn mentions he really wanted to play the monster in this but it was already cast but the director let him do it in one scene. Ryan Schifrin talks about the casting for Abominable. Christien Tinsley chats about his experience on acting for the first time in this. Lots of behind the scenes footage is shown. Ryan Schifrin mentions Duel was a inspiration since this was also his first full length experience & that was a lower budget production. Dee Wallace is actually featured more in this than the actual film. LOL They talk about the special effects in the movie. They go more into detail about the monster. Christien Tinsley did his fx for own death scene which was cool to see. Ryan Schifrin talks about the weather adding to the production value. He mentions various crew members that worked on the film. He brings up DP Neal Fredericks passing away before it was finished. This making of featurette covers pretty much everything you want to know about the movie. ‘6 minutes of “Deleted and Extended Scenes”. 4 minutes of “Outtakes and Bloopers”. “Shadows” is a 8 minute Black & White USC student film directed by Ryan Schifrin. “Basil & Moebius: No Rest for the Wicked” is a 16 minute short directed by Ryan Schifrin. It stars Zachary Levi (Chuck), Ray Park (Star Wars: Episode I – The Phantom Menace), Malcolm Mcdowell (A Clockwork Orange), Jose Pablo Cantillo (Crank 1/2), Walter Phelan (House of 1000 Corpses), & Kane Hodder (Friday the 13th franchise). I am impressed with all the talent involved for such a little production. It was a fun spy film with lots of action. It actually one of the best shorts that I’ve ever seen. “The original 2005 version of Abominable” really makes you appreciate the the updated version. If you want a more throwback vibe check this out. “Poster & Still Gallery” is almost 4 minutes. “Storyboard Gallery” is almost 3 minutes. You get two trailers for Abominable plus trailers for Return of Swamp Thing, Attack of the Killer Tomatoes, Savannah Smiles, & Black Eagle from the label. You also get an amazing retro looking slipcover, a DVD copy, & a mini collectible poster. MVD Rewind Collection once again provides top notch quality with this fully loaded release, I highly recommend this!!! !